Hello and welcome back to Early Bird Breakdown. It’s the eighth week of the season, last week the Packers were on their bye week so lets jump back two weeks for the recap. Two weeks ago Monday, the Packers played the injury depleted 49ers at home and on paper this should have been a blowout. San Francisco had a backup QB who every game threw two interceptions and looked demoralized ever since their franchise QB Jimmy Garapolo tore his ACL in week three and they lost every game since. However, the Packers were unable to get major momentum, both in game and for the season heading into the bye week, as the 49ers gave them quite a tough game. It came down to the final drives, where Kevin King had a clutch interception on the 49ers final drive to setup a game winning drive by Rodgers. It was not a pretty comeback, as Rodgers was sacked on third and 15 to almost assuredly force the game into overtime, but that was nullifyed by pass interference down field. Rodgers then ran for a big run to setup a Mason Crosby game winning field goal to win 33-30. It was not the comfortable win they would want from a bad team, but a win is a win heading into the bye week. If the last time you saw the Rams defense was during the game versus the Vikings, I have some bad news. Aaron Donald, arguably the best defensive player in the NFL, has shaken the rust off from his hold out and the defense held the last two opponents combined to less points than the Vikings put up. Rodgers biggest weakness has been defensive line pressure, specifically up the middle where it is harder to escape from as his best forms of escape are when he can roll out past the edge rusher. Rodgers knee needs to be better than it was two weeks ago to escape this pass rush or it will be a long day for the offense. The Rams are good both against the pass (7th in total yards) and the run (12th) but their defense is specifically designed to generate pressure on the opponents’ passing attack. The Packers run the ball third fewest per-play in the NFL, they need to run the ball a lot more in this game and take pressure off of Rodgers. The easiest way to do that would be to implement RPOs (run pass option) into the playbook (I’ll cover this more on the Rams offense section) but since we have not seen it used yet by head coach Mike McCarthy I would be surprised if he implemented it over the bye week. Runs in standard sets to at least setup play action would help, but we cannot keep being so one sided, especially as that plays into what the Rams stop best. The Rams run the NFL’s most balanced offense. They call the second-fewest pass plays with 51% of their play calls being pass plays. Despite this, quarterback Jared Goff is still fifth in passing yards and has been very efficient this season. The star on the offense though is running back Todd Gurley. Gurley leads the NFL in rushing yards and has already amassed 11 touchdowns in under half a season played. To put that into prospective, the last time the Packers had a season when their running back through 16 games had 11 touchdowns was Eddie Lacy in 2013. The Rams maximize these two players by running many RPOs, something that Packers fans may have gotten to get a look at with the last two weeks on Sunday Night Football as the Kansas City Chiefs also have been running them very effectively this season (or by watching college football for the last number of years). RPOs allow the quarterback mid play to opt into a run or pass by after the snap seeing how the linebackers adjust to the play as it is developing. Unlike a play action pass which is always a pass, the offensive line instead blocks as if it is always a run. Based on the coverage, the quarterback then makes a snap decision to either keep the ball and then throw it to a receiver or continue with the run play that has already developed and releasing the ball to the running back. Head coach Sean McVay has done an excellent job modernizing his playbook, similar to what Matt Nagy in Chicago has brought and Andy Reid has adapted to in Kansas City. Defensive coordinator Mike Pettine will have his hands full, as the Rams have been known to bring out new looks not seen on film on any given week. They are very hard to scout but the Packers have some players who can make big impacts to swing the tied in their favor. 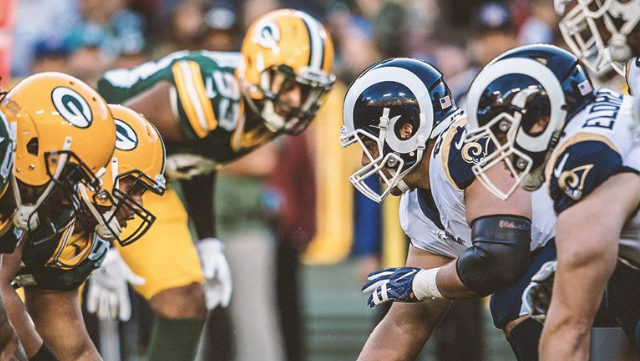 Aaron Donald is the best interior lineman in the NFL, but Kenny Clark is not far behind and should also make the Pro Bowl this season (since it is a fan vote, that is the only thing that would hold him back. His play absolutely warrants it). The Rams have a good but not great offensive line, and his presence combined with Mike Daniels, despite having a down year I still expect a bounce back, should be the most difficult defensive line that they have faced this season. If the Packers offense can score early to limit the Rams running plays combined with both Clark and Daniels having a big day, the Packers may very well mitigate the Rams best offensive player putting them in the position for an upset. If Goff cannot make use of RPOs, he can be exploited for turnovers. While he has not thrown many picks since McVay has taken over, he also is rarely forced into a shootout. If Green Bay can pressure the Rams by forcing them to throw, the Packers have the potential to pull off the upset of the week. LA has an expected kickoff temperature around 78 degrees and cooling from their as the game goes. No winds, perfect conditions. For you fans who know about point spreads, this is the largest underdog they have ever given an Aaron Rodgers led Packers team in his career at +9 (meaning, if you bet on the Packers, you still win money if they can hold it within 9 points). Normally, history would favor the Packers as they have a 7-2 record under Rodgers after the bye week and historical lines usually favor the Packers. However, the NFL has this season already seen a far bigger upset (with Bills over Vikings) so take these lines with more than a grain of salt. Having said that, it is going to take a lot to beat this team. The Packers might be best served going against the grain and opting to receive the kickoff if they win the coin toss (generally you want to be the team that receives the ball when the second half begins). The Rams balance is going to be difficult for the Packers defense to shutdown without help from the offense. If the Packers offense can jump out and score on the first two possessions while stopping the Rams on their first possession, it will limit the amount they can utilize their best offensive weapon in Gurley. While Goff has been great at QB, they are not the Chiefs who can solely rely on passing to shoot out with anyone. The Rams will score, but without chewing the game out with Gurley they can be defeated. They have been only held under 30 once this season, so they likely will keep pace with the Packers but limiting Gurley opens the door for more turnover opportunities which will be critical. Getting that scenario against this defense will still be tricky, and Goff has just had games where he goes off. A lot needs to go right for the Packers to win, and I certainly can see them winning, I also can see from the first six games how horribly this can all go wrong. If Rodgers knee limits his mobility, I do not see how he can escape Donald consistently enough to keep pressuring the Rams into a shootout. I think the Rams win 38-27. This entry was posted in Early Bird Breakdown, Stuart Weis, Uncategorized and tagged Aaron Rodgers, Green Bay Packers, Jared Goff, Kenny Clark, Mike Daniels, todd gurley. Bookmark the permalink. If the real Packers show up, we’ll win this game. Personally, I’d line up two TEs and run right at this smallish defense. The Packers do not have 2 tight ends that can block worth a crap. They do not even have one. Lewis has been a Joe Johnson-esque bust. Good idea, it fails in the execution. Very wrong. Lewis has been, and still is, one of the best blocking TEs in the league. Joe Johnson, by comparison signed for a fortune and then was hurt most of the time.